Copyright, 1884, by Chas. D. Blake & Co. The crooks may all on this rely, it's clear as sun at noon. 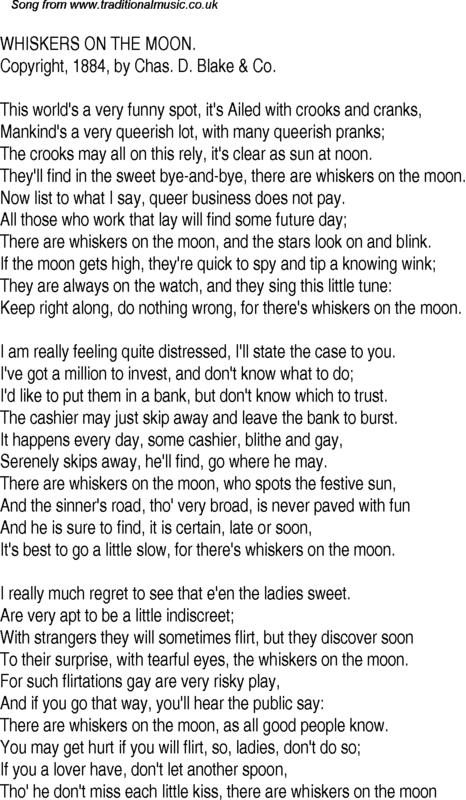 They'll find in the sweet bye-and-bye, there are whiskers on the moon. Now list to what I say, queer business does not pay. There are whiskers on the moon, and the stars look on and blink. Keep right along, do nothing wrong, for there's whiskers on the moon. I am really feeling quite distressed, I'll state the case to you. I'd like to put them in a bank, but don't know which to trust. The cashier may just skip away and leave the bank to burst. Serenely skips away, he'll find, go where he may. It's best to go a little slow, for there's whiskers on the moon. I really much regret to see that e'en the ladies sweet. To their surprise, with tearful eyes, the whiskers on the moon. There are whiskers on the moon, as all good people know.